US Smartphone ownership reached a tipping point in June, 2011, when smartphone shipments increased and feature phone shipments decreased, based on comScore data. Here are ten mobile marketing facts you need now and what they mean for your marketing. Ignoring smartphone owners? Think again. Over 40% of US mobile subscribers own a smartphone, a 45% increase from 2009, according to Nielsen. More importantly, smartphone penetration is roughly 50% or more among 18-54 year olds, those with incomes and purchase decision-making authority. ACTIONABLE MARKETING TIP: Have a mobile version of your website to ensure your organization is findable via portable devices. Search- how we navigate on mobile devices. Search is the dominant activity on mobile devices since it’s easier and faster way to navigate on smaller devices. While Google is mobile search’s 900 pound gorilla, don’t overlook Facebook, Yahoo, Wikipedia and YouTube as mobile search alternatives. ACTIONABLE MARKETING TIP: Incorporate mobile search into your search marketing strategy. Use terms and keywords that shoppers are looking for close to purchase (even if you’re an etail only company!) since they may be in your store or a competitor’s establishment. Social media connects via mobile. Two thirds of smartphone owners use social media according to comScore. 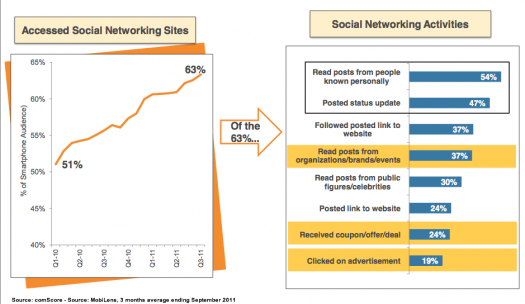 About half access social media via their smartphones to read posts from friends and family or to post status updates. This makes sense. 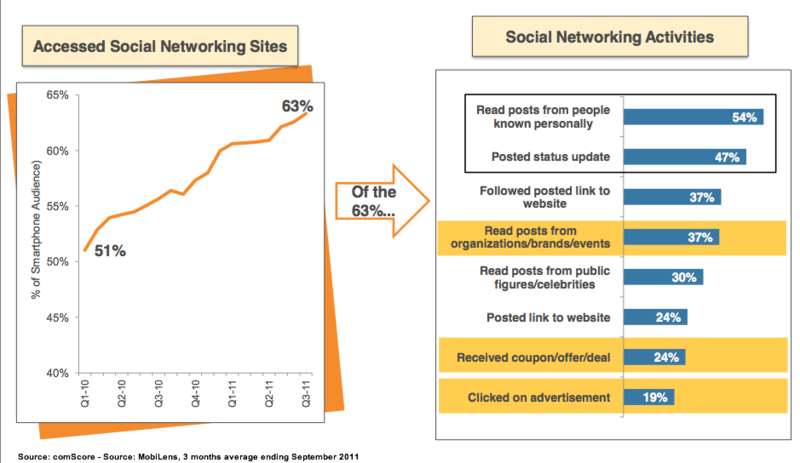 Of importance to marketers is that over a third read content from organizations and brands. Further, a quarter of these owners receive coupons. ACTIONABLE MARKETING TIP: Make sure that your social media content is mobile-friendly by using bite size chunks of information. Also, be prepared to deliver coupons to mobile users to close a purchase. We want our apps! 60+% of Smartphone owners downloaded an app within the last 30 days according to Nielsen. The average app downloader has 33 apps on their phone, up 22% from 2010. Apple phone owners download more than others. 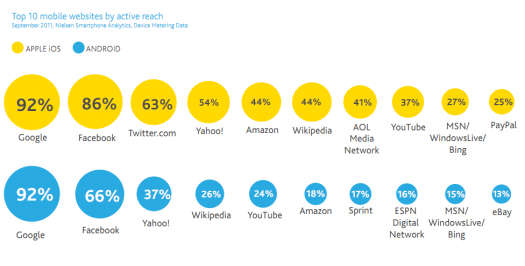 Android owners use apps and the mobile Internet about equally. ACTIONABLE MARKETING TIP: If you’ve been sitting on the mobile app sidelines, assess the potential for using a mobile app to support a specific on-the-go element of your offering. It can be entertainment or a game or targeted content users need when they’re using their mobile device. Use apps for branding and product support. Help—Which app do I get? 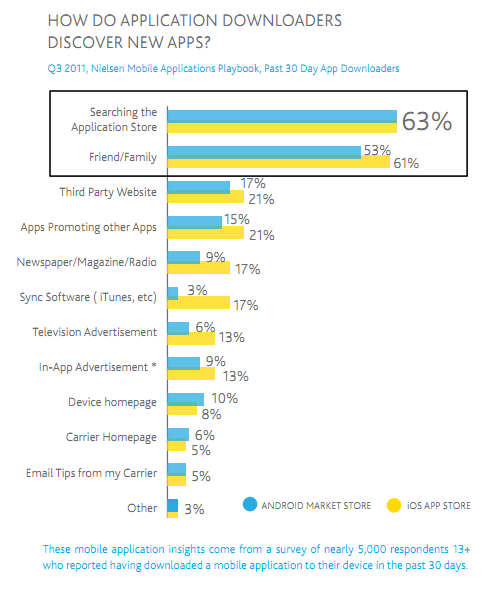 By far, the major two ways apps are discovered are via the App Store and recommendations from family and friends. Other ways of discovering new apps vary, with no method being significantly better. Don’t fret—there’s a silver lining. The top 50 apps list continually changes. 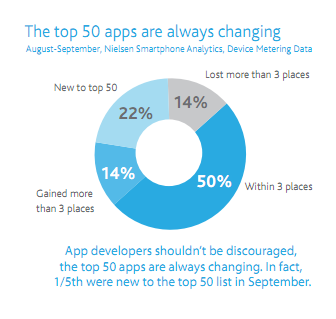 About one fifth of the top 50 apps are new each month. ACTIONABLE MARKETING TIP: Test a variety of methods for attracting app downloads. Use an effective call-to-action and make the download trackable where possible. Further, use low cost internal media to support your app promotion. Got kids? Chances are your smartphone is their new toy. Smartphone owners with children reported that their kids downloaded over one quarter of their apps. On average, children start downloading apps at age 10 based on Nielsen data. BTW, your spouse probably is using your phone as well since they account for over 10% of downloads in the last 30 days. 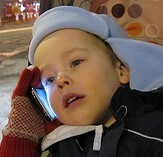 ACTIONABLE MARKETING TIP: If your product appeals to kids, consider creating a mobile app. Alternatively, sponsor a child-friendly game. Mobile is where the purchasing action is. 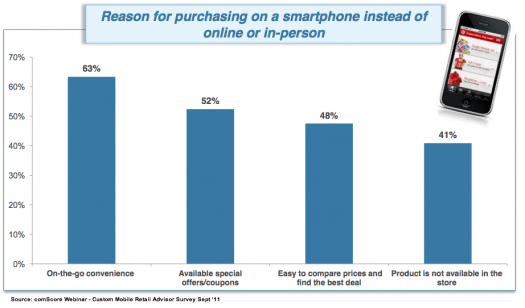 Roughly four out ten smartphone owners have bought via their device according to comScore. This understates mobile purchasing because information gathered via a smartphone can support a purchase decision although the purchase is made via another channel. ACTIONABLE MARKETING TIP: Give on-the-go shoppers the option of using your website or click-to-call. Who goes to the mall anymore? When it comes to mobile shopping, shoppers list mobile coupons, comparison shopping and lack of product availability as reasons for mobile shopping according to comScore. Show me the discounts! ACTIONABLE MARKETING TIP: Regardless of where you sell, online, direct mail or retail, ensure that prospects can find your product on a mobile device and order via mobile or phone. Also, deliver coupons via mobile. QR codes get scanned. About one out of five smartphone owners or 16 million people scanned a QR code according to comScore. 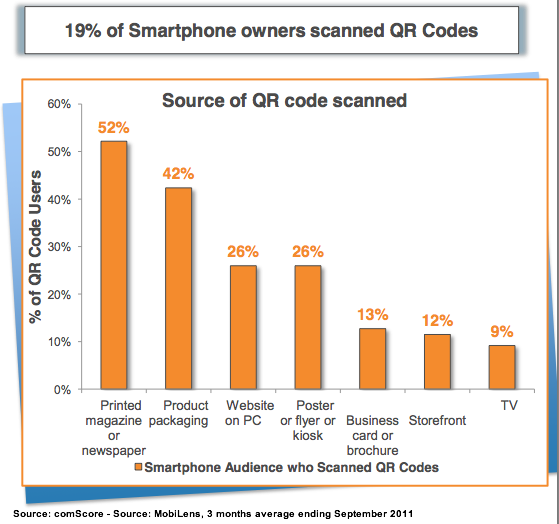 While print media dominates QR code scanning, over 40% of users scanned products and over 10% of users scanned storefronts. ACTIONABLE MARKETING TIP: Test QR codes to leverage internal media to connect with prospects while they’re shopping. Think product labels, store displays and store windows. Don’t stop there! Make sure that the information you connect your QR code to is top quality and provides relevant content or you’ll loose prospects! Don’t call me! Since smartphones provide owners with a variety of ways to communicate, don’t assume they’re interested in making phone calls. Voice usage has declined while text messaging has increased, based on Nielsen research. The one thing that hasn’t changed is that women communicate more than men! ACTIONABLE MARKETING TIP: Despite this trend, include your phone number in your mobile search ads and websites to ensure prospects and customers can click to call if they wish. Remember they’re closer to purchasing when they’re using their smartphone. Incorporate mobile marketing into your overall marketing plans to ensure that your offering is part of the purchase process when and where prospects are shopping. This means mobile website, mobile search and a phone number (preferably accessible 24/7). Do you have any other must-have mobile marketing suggestions to add to this list? If so, what are they? 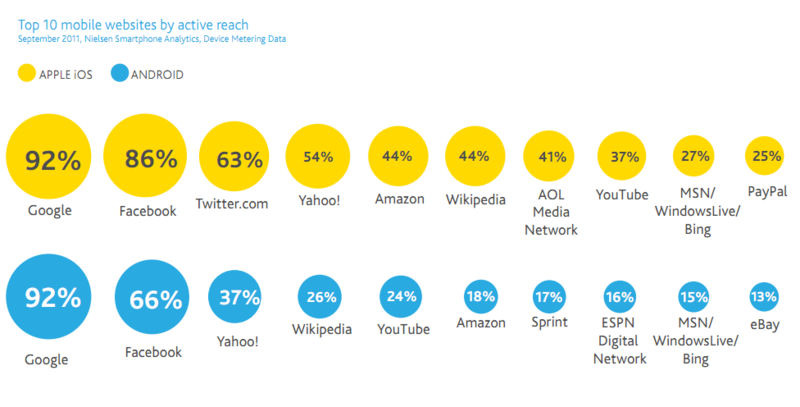 Tags Actionable Marketing Tip, Chart, comScore, Nielsen, Research, smartphone. Bookmark the permalink.